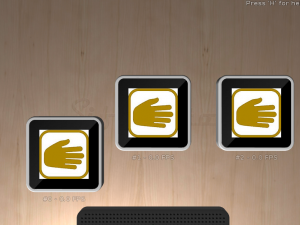 This project is designed to implement Rock-Paper-Scissor game on Sifteo devices. 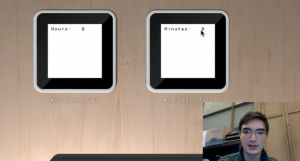 With each user using one cube, it allows users to bid their choices by tilting and tapping and to challenge other players by neighboring others’ devices. My Sifteo project ended up being the one that I am most proud of out of the four. 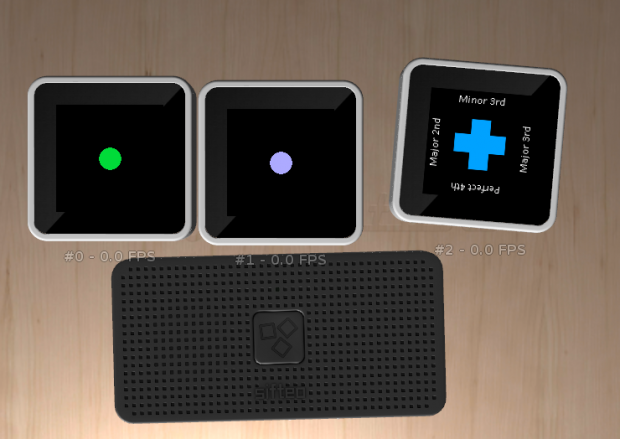 I created a small step sequencer and composition system for Sifteo. The starting pitch and tempo are set at compile time, and from then on there is a master cube that will always play the starting pitch on the downbeat. From there you can add up to 7 other cubes into the composition. Adding cubes on top of other cubes will create chords, whereas adding cubes to the sides of other cubes will create melodies. The notes on the other cubes are dependent on the pitch of the cube you are connecting to (the base pitch), the side of the cube you are placing (determines whether to make a Major 2nd, Minor 3rd, Major 3rd, or Perfect 4th using Pythagorean tuning ratios on sine waves), and whether you are adding or subtracting that interval from the current. It’s pretty fun. Unfortunately all the Sifteo cubes in the STUDIO died so I couldn’t test on the hardware for this round of documentation. 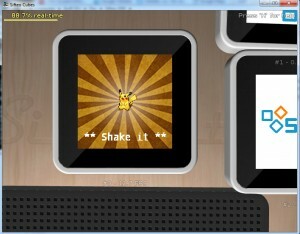 A very basic program utilizing the shake function of the Sifteo cubes. An animation is played after the cube has been shaken. The program is based on the Stars example. This part was also tough because I never worked with the Sifteo SDK AND I don’t have any experience in C++. I took a fair amount of time just trying to understand the syntax and the way things are setup. 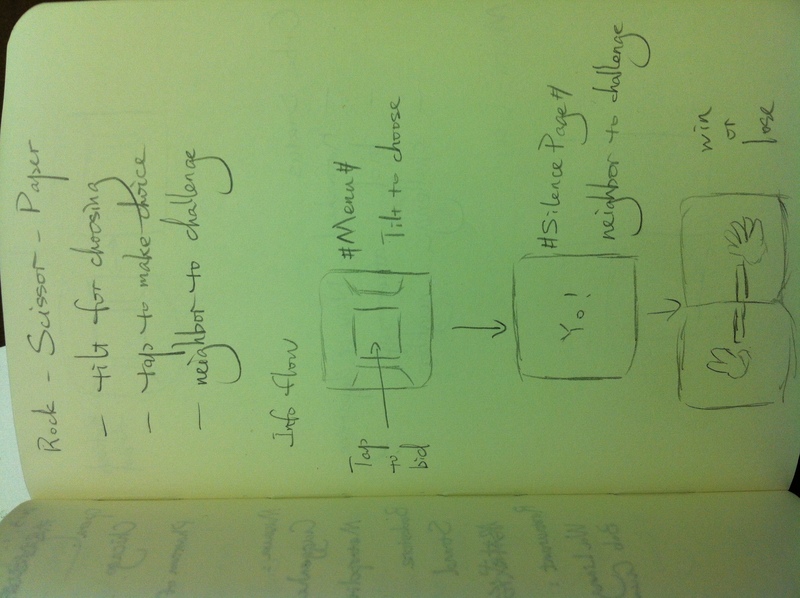 I had some ideas before I dived into the Sifteo SDK, and I quickly realized that it would be very tough to get something working. Even getting an animation into the cube took quite some time due to the specifications of the sprite itself. *Sorry for the sound. Wasn’t aware that it was recording from my mic as well. While I think that Pittsburgh is trying to make up for its last ‘winter’, I have been inspired by the white snow everywhere I go this week. I modified the Stars example to make three snow globes for this Sifteo project. I used a photo of a mountain as the first layer background (bg0), and the photos of snow and a skating duck as sprites. The snow keeps falling every time the image is updated, but the duck stays stationary. If I had more time, I would like to either move the duck back and forth from one cube to another. I also want to produce more snow every time I shake the cubes. Oh, and I want to add an audio of the song ‘Let it snow’. Oh Sifteo, you are too cruel. Seriously, having never worked with any system remotely like this before, I found this project to be completely unapproachable. The documentation for the SDK is lacking and there is significant overhead to get started on these projects. I sort of feel like a solid foundational understanding of C++ is really the only way to travel in Sifteo world. By the end I figured out the events system pretty well. My demo is a first foray into getting something up and running with (limited) intelligible value. 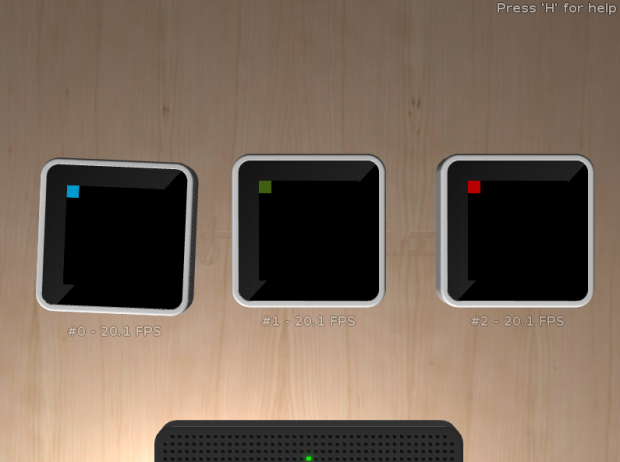 Basically I’m displaying the accelerometer data coming off the cubes graphically. It’s a simple application to be sure, but it took my whole brain several hours to get this far! This is a collaboration work with Can (John) Ozbay. 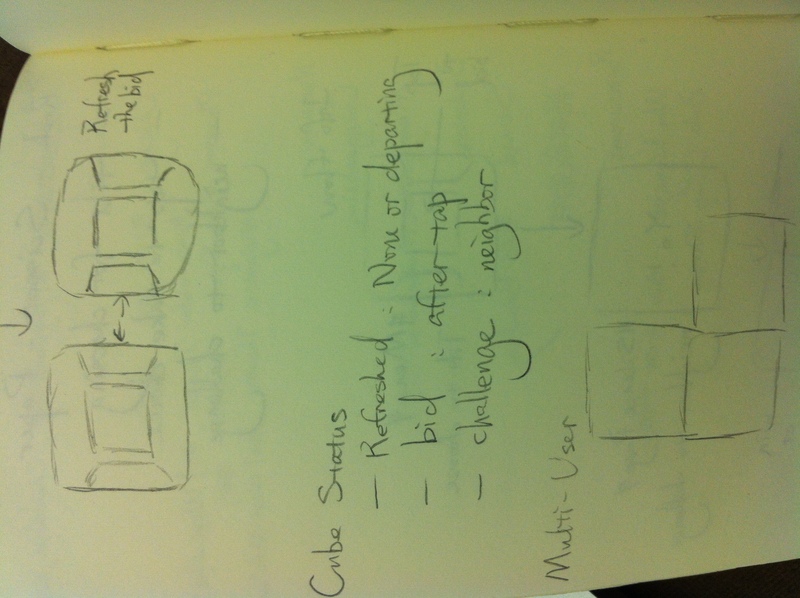 My original idea for a sifteo app was a game where each cube would display a word belonging to a different part of speech (noun, verb, adjective, etc). You’d have some amount of time to piece the cubes together in a logical sentence, before they would all switch to some other word/part-of-speech, and you’d have to begin from scratch. 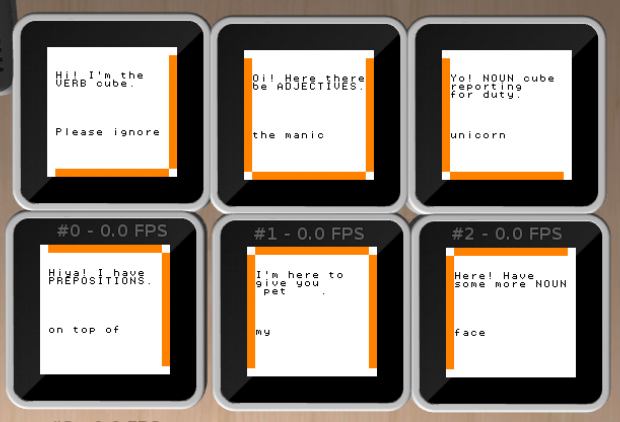 This version takes the original sensors demo and modifies the “shake” detection (through acceleration sensing) so that a random word will be displayed on each cube when you meddle with it. You can arrange the words to form (hopefully) amusing sentences. The name of the app comes from some somewhat taboo ‘dice’ you might have seen at a party sometime in your existence. There is nothing very taboo about this app. 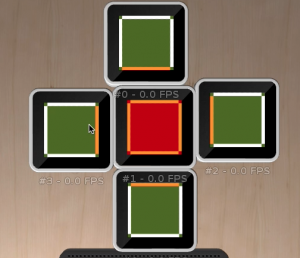 If I were to take this project forward, I would like to be able to load background images or background colors into each cube, depending on the part of speech displayed. I was having a hard time with it this time around, I eventually came to realize, because I’m currently using bg0_ROM mode to create the text, and .png background assets weren’t playing very nice with that mode. Given more time, I would re-write the whole thing so that I was working in a different draw mode, and the displayed text was done using png files. This was the one part of this assignment I had most trouble with! Although I found the Sifteo docs to be only minorly helpful in this assignment, I should have for seen this and started earlier. I began this assignment thinking I would do something like a word game for the blind. The blocks would each represent a letter. When tapped on the block would say what the letter was. If the letters were arranged from left to right in order, then a affirmative sound would be played, and the next word would be auto scrambled. I was able to get the word split into letters and divided among cubes, but when it came time for me to see if the user had spelt the word out correctly I ran into a problem where I was not understanding how to reference each cube individually. This lack of understanding caused me to spend a bunch of time looking over the SDK website, which had few answers. Ultimately, given the time, I decided to scratch the initial idea for a simpler one that was closer to an example I fully understood – the sensor’s example. I decided to make use of screen colors and assign these based on cube adjacencies. At first I had some problems with the background colors, but managed to set these in the end. For a bit of extra interaction I decided to make use of touch. When a cube is touched, it changes the entire color scheme, while maintaining the fact that the color coding is based on adjacencies. Overall the effect looks like it would be fun for a baby or a cat.